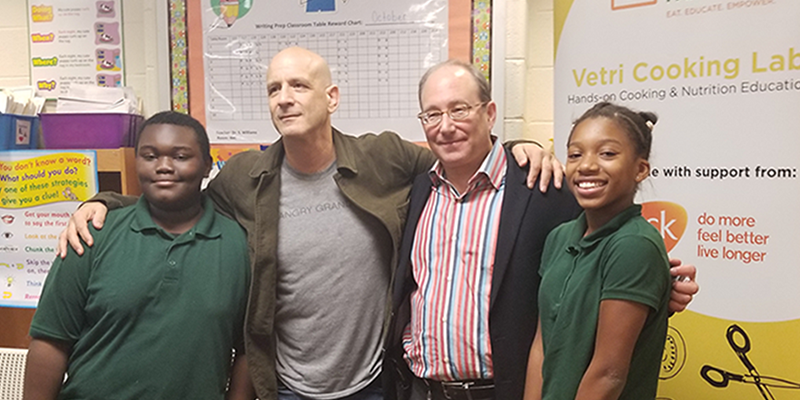 PHILADELPHIA, October 17, 2017 /3BL Media/ - Yesterday, GSK Senior Vice President & General Counsel, Daniel Troy, announced a $440,000 grant to Vetri Community Partnership, alongside Founder Chef Marc Vetri and CEO Marlene Olshan, at Dr. Tanner G. Duckrey Public School in North Philly. The grant will expand Vetri Cooking Lab, an after-school nutrition and cooking education program, to 1,200 students across the region. Vetri Cooking Lab teaches young people how to cook their own healthy, delicious meals using ingredients they can find in their own neighborhoods to form healthy eating habits for life! Read the full press realease. Learn more about the Vetri Cooking Lab.